Summer 2015- Summer in the Psalms. After warning the people against the scribes, Jesus sat down where He could watch people give their offerings. The treasury of the temple was located in the women’s court. Thirteen trumpet-shaped receptacles were set up to receive donations, purification offerings, and the half-shekel tax. Jesus watched as the wealthy put large sums of money in the offering boxes. Then a poor widow put in two small copper coins. 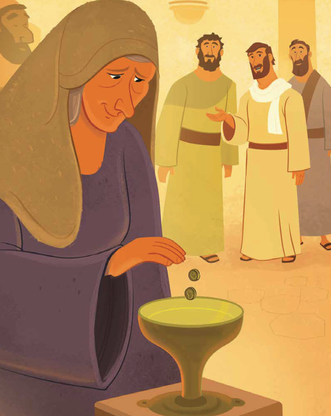 Jesus summoned His disciples and remarked, “I assure you: This poor widow has put in more than all those giving to the temple treasury” (Mark 12:43). Undoubtedly the disciples were astonished. The widow had given the smallest amount of currency in Jesus’ time. Hadn’t Jesus noticed all the others giving more? The widow was desperately poor. Jesus mentioned that she had given everything she had to live on. The woman, who should have been a recipient of charity, instead gave to God, trusting Him to take care of her needs. The wealthy people, however, had given out of their surplus. They gave a lot of money, but it did not really “cost” them much. Ask each family member to go get the best gift she has been given recently. Guide each family member to show and tell about her gift, explaining why it is her favorite. Remind kids that everything we have is a gift from God. Read Mark 12:41-44. Discuss ways you can serve Jesus with what you have, no matter how much or little. ​I hope that gives you a little more understanding of what your child learned this week. I encourage you to review this story with them at home and utilize the Family Journal Page PDF below this letter throughout the next week. If you would like a copy of the songs the children are doing in Sunday School for this unit, or if you have any other questions please feel free to contact me. Why can we joyfully give to God? ​Son of Man by the prophets will be accomplished." Would you like to receive this information to your email every week? Sign-Up Here!